You like Basler cameras. They’re compatible with your software, deliver great images, and have proven reliable. But what if the camera needs to be installed in a wet, dirty environment? You could put the camera in a protective enclosure, but that would require more space. Besides, you’re not too confident in how well enclosures can be sealed where the cables exit. You need an imaging solution that’s compact but can handle the environment. And only Machine Vision Store has the solution. Introducing the first IP67 Basler camera. Available exclusively from Machine Vision Store. The camera’s housing is quite compact. With a diameter of 65 mm and with the (optional) lens cover installed, it’s about the same size as a can of beer. On our unofficial postage scale it weighs in at 350 grams. The lens cover adds 250 grams. The black anodized housing is sleek and unobtrusive. The lens cover’s window is made from polycarbonate for compatibility with food packaging areas, and is surprisingly clear. The back of the enclosure has two M12 connectors that completely seal out dust and liquid. One is X-coded for gigabit Ethernet. The other is A-coded for input, output, and power. This camera is PoE compatible. We’ll soon be offering shielded cables with right-angle connectors that make for an extremely small footprint. 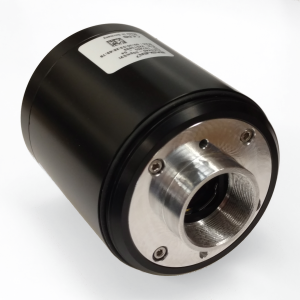 This camera is ready for demanding projects in rugged environments. The 5 MP Sony IMX264 sensor delivers beautiful images. With 68% quantum efficiency, it needs less light than older cameras. And its 63 dB dynamic range enables capturing high-contrast scenes. The GigE Vision compatible output delivers 23 frames a second, or more at lower resolutions. For example, at 2448 x 1080 pixels, it will run at 43 frames a second. Like its brother, the acA2440-20gm, this camera offers the full range of features you expect from Basler. 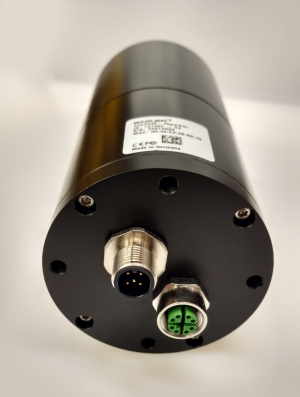 And this camera is compatible with Basler Pylon, as well as Cognex VisionPro, National Instruments Vision Builder and Lab View, Matrox Imaging Library, MVtec Halcon, and others. This camera (CABP176), lens cover (EEBR100), and mounting bracket (BTIS102) are available for purchase now through our online store. Contact us for help choosing accessories.